Spinoffs have long been a hedge fund favorite for arbitrage opportunities. That was of course before the days of derivative structures that allow asset managers to take on and hedge risk in countless ways, and not necessarily in the most intelligent fashion. A spinoff is still a good opportunity and there are more than a few academic studies, mostly from the 80’s and 90’s, that provide evidence behind the strategy of investing in spinoff opportunities. Reading academic reports, even when one is engaged in the content, can at times be like watching paint dry whilst watching Empire by Andy Warhol in the background. However, Joel Greenblatt, one of the most successful hedge fund managers of all time, dedicated an entire chapter to spinoff opportunities in his classic book on speculation, You Can Be A Stock Market Genius. He takes a light-hearted approach to sharing his successful experience with spinoffs. You get the first-hand account of a true professional who has made money strategically utilizing spinoff situations as opposed to the dull but factual report of some PhD who’s never worked a day in the private sector. Had to dust off my old copy to share some of his stuff but in chapter 3, Chips Off the Old Stock, Greenblatt covers the basics of speculating in spinoff situations while covering several working examples with Marriott, Home Shopping Network, Sears and a few others. He also goes over rights offerings with a Liberty example as anyone familiar with John Malone knows he loves to complicate things with a rights offering. Want an abridged version of how Malone made so much damn money transitioning to Liberty? Have a read of the end of chapter 3 in Greenblatt’s book. If you accept the assumption that over long periods of time the market averages a return of approximately 10 percent per year, then, theoretically, outperforming the market by 10 percent could have you earning 20-percent annual returns. If the past experience of these studies holds true in the future, spectacular results could be achieved merely by buying a portfolio of recently spun-companies. Translation: 20-percent annual returns — no special talents or utensils required. For the ETF-everything crowd, there’s even an offering for you which will allow you to outsource your intellectual efforts in case you’re not so keen on sifting through any Form 10s. Guggenheim offers the Beacon Spin-off Index (CSD), with approximately half a billion in AUM. If you’re already familiar with the offering then you know that results have been less than exciting compared to the picture Greenblatt painted, but such is the case when using an ETF instead of digging in and conducting your own due diligence. Below is a chart of performance since inception. It is easy to see the tight correlation of CSD’s (candlesticks) performance to the S&P 500 (blue dash), however since The Great Recession, it has consistently outperformed the S&P 500 by a couple of percentage points. Not exactly the stuff that makes up 20% annual. You Can Be A Stock Market Genius is 18 years old. Many of the academic studies regarding spinoffs are equally as old or older. This means the data and situations covered came long before massive quantitative easing, ZIRP, high-frequency trading, and after Gramm-Leach-Bliley; four of the biggest reasons there is wide-scale questioning of true price discovery in most markets. Despite one’s perceptions of a skewed marketplace, the markets are still functioning and there is money to potentially be made, which brings us to Energizer. 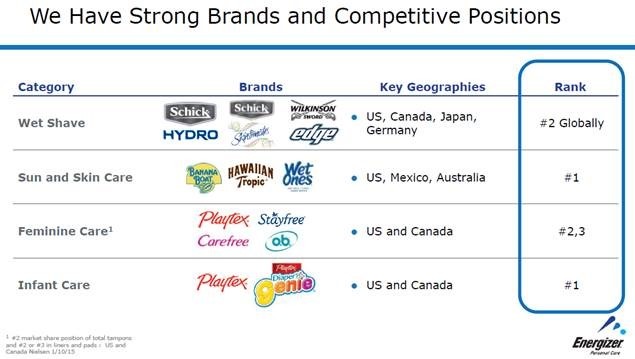 Even though Gillette’s grip on the razor space is massive, Schick’s entrenched position at number 2 in the world allows for some impressive cash flows. Additionally, holding the number 1,2, or 3 brands in the rest of the product categories has Personal Care, which will be renamed to Edgewell subsequent to new Energizer’s spinoff, well positioned to continue generating solid free cash flows. 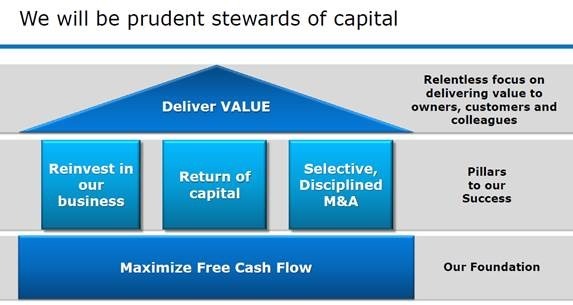 One of the current Energizer Holdings stated focus areas for management is free cash flow. In fact, a handy chart is provided right on the 2nd page of the most recent 10-K that shows the last 5 years’ worth of the company’s free cash flows (FCF). We now know we have company management publicly aligned on shareholder-friendly initiatives, so let’s go over some of the particulars of the spinoff. Edgewell’s ticker will be EPC while the Household brands will maintain the Energizer name and continue to trade as ENR. For convenience and clarity, I will simply refer to each new company as their ticker symbol and if needed will refer back to the current combined company as Energizer Holdings. The spinoff will be a 1 for 1 share distribution in a very straight-forward, tax-free separation without a convoluted package of rights offerings or tax strategies. The Form 10 is the document where anyone can review the details of the spinoff. For some, combing through the Form 10 can be the most cumbersome part of analyzing a spinoff transaction, however, so much of the content is simply boilerplate legalese that it doesn’t take as long as one might think to go over the entire document. Energizer Holdings filed an amended Form 10 on March 25th of this year and it runs 212 pages, but again, don’t let that length inhibit you if you really want to scrutinize the potential of the deal. Great, but let’s take a look under the hood of the SpinCo., which is new Energizer (ENR). 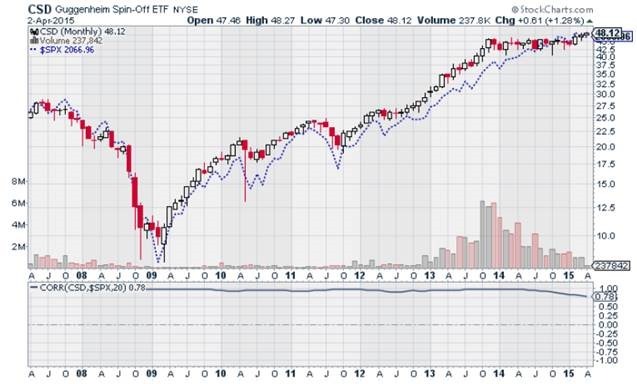 Edgewell (EPC) will technically remain as the “parent” company. In the Form 10, SpinCo. prepared financial results for a year-end as of September 30th, 2014 as if the company already split as of October 31st, 2014. Let’s first examine ENR’s top line over the last 3 years. So if this is your first time seeing ENR’s sales results, you’re probably thinking “Whoa!” Where’s the growth? Decreased net sales for the last 3 years with a total failure to generate any organic growth, which is an unaudited metric that corporate managements usually take extra care to positively affect. But wait, it gets worse. You can see that the trend in the top line was already flattening from 2010 to 2011 precipitating the decline that really kicked in in 2013. This slowing can be interpreted in two ways. One is that the business is stodgy and its main product line, alkaline batteries, lacks innovations to carry it forward into the evolving universe of devices. Or, the lack of sales growth is only temporary as management allocates greater resources to R&D to spark innovation across the product lines. Additionally, growth could be purchased through intelligent bolt-on acquisitions that work to enhance the culture of free cash flow growth. ENR’s free cash flows in conjunction with access to low-cost capital will provide management with flexibility to explore this option down the road. The production of FCF by ENR has been a bit choppy the past few years but the average has still been about $200M a year. None the less, ENR is producing declines in revenues and profits across all geographic segments around the world. Additionally, SG&A continues to be higher than what I would like from a focused management with this particular expense category coming in at $391M as of September 30th, 2014. Making SG&A approximately 21% of net sales, which in my opinion is bit high but I understand separation costs and the working capital initiative have bitten into this area. We’ll partially chalk it up to a cost of building capital efficiencies. One of the areas that has a tendency to get closely examined in a spinoff is executive compensation. How will pay be aligned with operational goals? Will those same goals be necessarily shareholder friendly? These are important questions to ask. More so I think with companies that utilize an excessive amount of share-based compensation and really dilute existing shareholders while the company may still be struggling to even generate a profit. Happily that is not the case with Energizer Holdings and current executive compensation policies will roll out to new Energizer and Edgewell. Salaries for the CEO, COO, and CFO for new Energizer are reasonable with base salaries in the $400’s annually for the CEO and COO while the CFO is in the $300’s. Stock awards and short-term non-equity incentives i.e. cash bonuses will take the three of them up into the $1M to $2.5M range for total annual compensation. In a company of approximately 5500 employees and a stated goal of quality capital stewardship, I’m ok with the top 3 employees earning around $5M total for now. Again, the focus is on free cash flow while creating shareholder value and the retention of quality talent requires fair compensation in light of general employment market conditions. • relative total shareholder return to further ensure that realized results are aligned with, and shareholder value creation results from ROIC and EBITDA can be further impacted by relative total shareholder return. Margin Rich here again, for the cash bonuses the payouts aren’t simply based on earnings or profits. It’s earnings, operating profit aka cash from operations, company ability to reduce expenses, and working capital efficiency to help drive free cash flows. The stock awards are based on ROIC, EBITDA, and total shareholder return. These incentives seem quite shareholder friendly in light of the cronyism, greed, and career risk that runs rampant through the corporate world these days. Ok, so I realize I’ve presented a little bit of a conflicting opinion here by pointing out the declines of the battery business but sharing appreciation for management’s focus on free cash flow and reasonable compensation packages for executives. The reason is because from a speculative standpoint, this spinoff can be approached in multiple ways. As a long-term investor, or at least 3-years according to the study, going long EPC and ENR provides what could be a solid opportunity to generate a market beating effort. Consider the pros: shareholder friendly management, great free cash flows, reasonable debt levels, and the tail-wind of the average performance of spinoffs according to several different academic studies. The cons: ENR’s declining revenues and profits, lack of innovation at ENR, and the negative perception that comes with the first two cons. 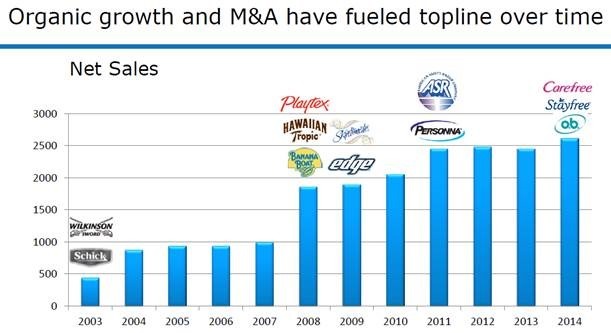 Have a look at how Personal Care and Household have stacked up against each other in sales and profits for the last few years, via the most recent 10-K.
It’s plain to see where the growth and the slump has occurred within Energizer Holdings. This is why I think the short-term trade is to go long EPC and short ENR. The battery business may get sold off as investors vote with their feet behind the company’s declining earnings. Obviously, nobody has a clue as to how the market is going to react to the post-spun shares. Both could sell off indiscriminately or be bought in a frenzy. These are the obvious risks of speculating, but they’re worth reiterating time and again. Another risk to consider is the ticker-risk with EPC. ENR is the current ticker of Energizer Holdings and the spinoff of the battery business will maintain that ticker. As EPC will be the new ticker that shows up in the accounts of current shareholders of Energizer Holdings, EPC may get sold off indiscriminately despite its higher growth profile in sales and earnings. There’s plenty to consider here if attempting to capitalize on the Energizer spinoff. This is just a light dusting of research that should be undertaken for an intelligent investment. There’s still cash flows to model. The patent portfolios are fairly significant and would require a detailed look, if possible, to gauge value. Additionally, the capital structure has still not been finalized for new Energizer. Always conduct a thorough analysis but you can see that a spinoff presents a fun opportunity to test your skills as an analyst and speculator. Bear in mind, the professional set has picked this opportunity apart and modeled it a dozen different ways so if any readers attempt to allocate capital on this play; don’t try to be too cute. There are a multitude of sites that allow anyone interested to stay on top of spinoff opportunities. One of my favorites is SpinoffMonitor.com. You can also check out StockSpinoffs.com or StockSpinoffResearch.com. Energizer Holdings is widely followed, and again, it’ll be analyzed six ways from Sunday by every analyst and money management firm out there. For a fresh research opportunity, consider W.R. Grace, which will be splitting itself into two companies. Grace is a well-capitalized, diversified chemical manufacturer. Each new Grace company will be an upper-tier participant in its respective industry. Have fun and good luck.